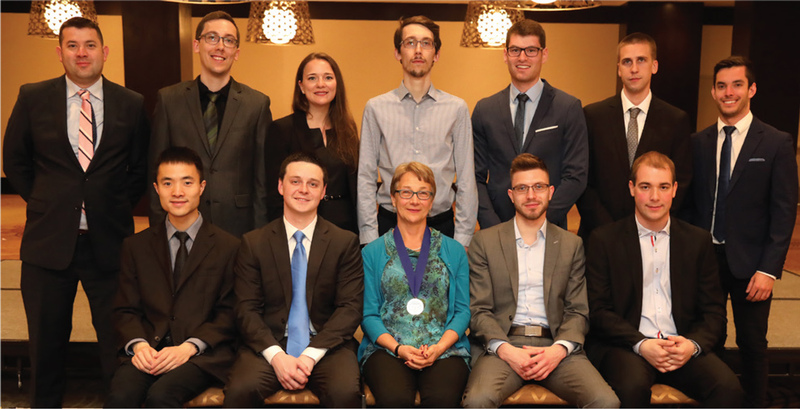 Row 1, left to right: Yong Hao Bai, Buddy Niece, Gregory Spindell, Nicholas Blaubach, CAS President Nancy Braithwaite, Minh Phan, Victor Lauzon, John Pagliarulo, Jason Nikowitz. 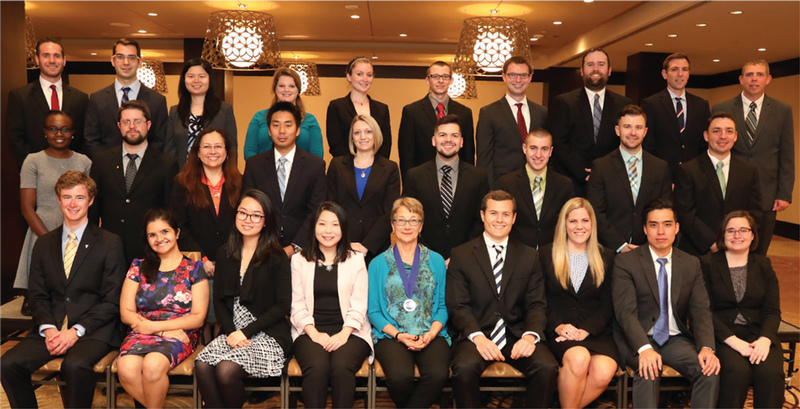 Row 2, left to right: Courtney Sibert, Kara Boehm, Nathan Dykstra, Juan McNamara, Marino Vasantharajah, Gao Niu, Dustin Duncan, Xiang Wang. Row 3, left to right: Alyssa Ferrando, Michael Liston, Victor Lopez, Zhoujie Guo, Tyler Eberly, Matthew Galinsky, Maximillian Kehrli, Jason Wix, Andrew Switzer. 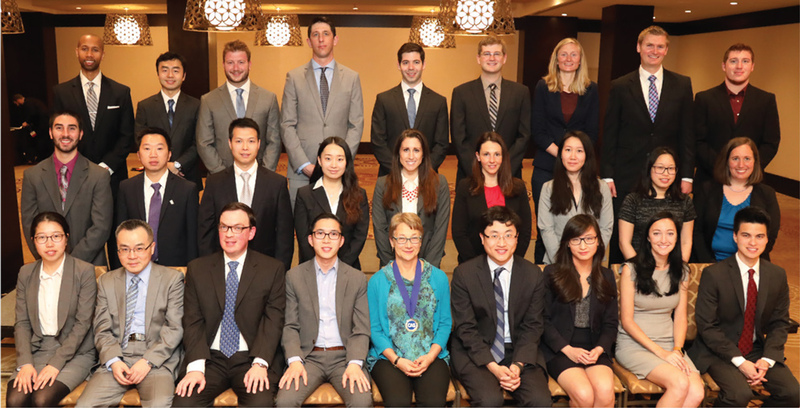 Row 1, left to right: Phillip Spolarich, Nicholas DeNardo, Jianming Zhang, Fang Shi, CAS President Nancy Braithwaite, Rachel McNutt, David Ren, Alexander Stemplewski, Shevon Retske. 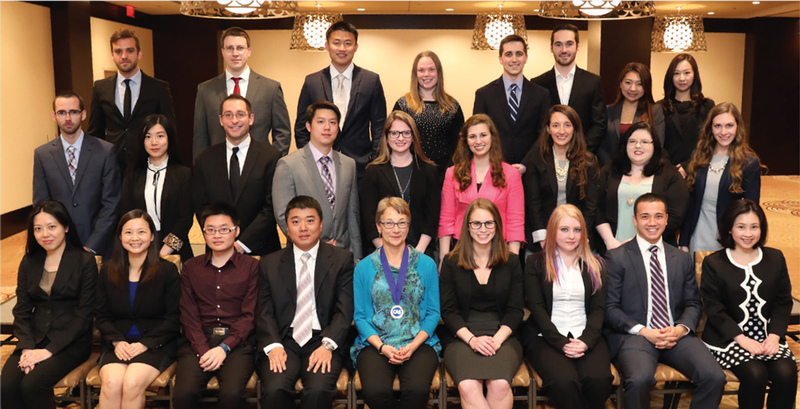 Row 2, left to right: Ruiqi Li, May Ho, Cesar Franco, Katherine Zuckerman, Selene DeWolfe, Nicholas Gurgone, Logan Jaklin, Jonathan Almagro, Michael Burr. Row 3, left to right: Julius Ekow Appah, Nathan Heng, Dmitriy Korogodskiy, Huan Liu, Ravi Sharma, Aaron Halpine, Jill Gonzales, Derek Shupe, Andrew Brooks, Benjamin Kane. 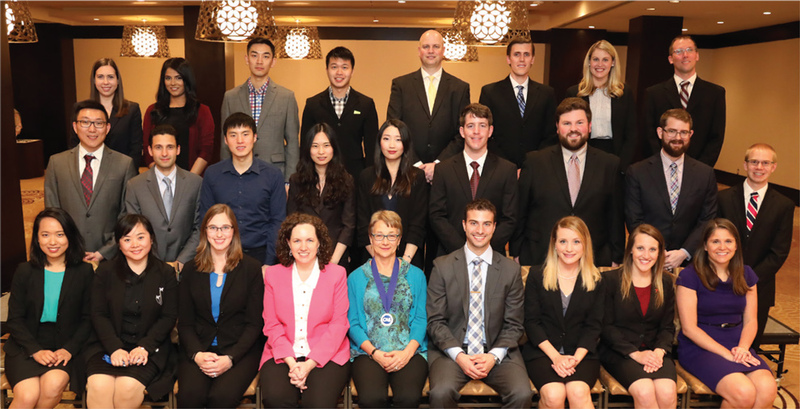 Row 1, left to right: Erik Fingar, Sunanda Mishra, Yue Xu, Hio Lam Lao, CAS President Nancy Braithwaite, Ryan Voll, Kirsten Soucek, Young Kyu Park, Lindsey Peniston. Row 2, left to right: Ruth Maringi, Eric Brecht, Debralynn Kahikina, Arthur Okura, Christina Dussault, James Wood, Derrick Bennett, Travis Murnan, Steven Caster. 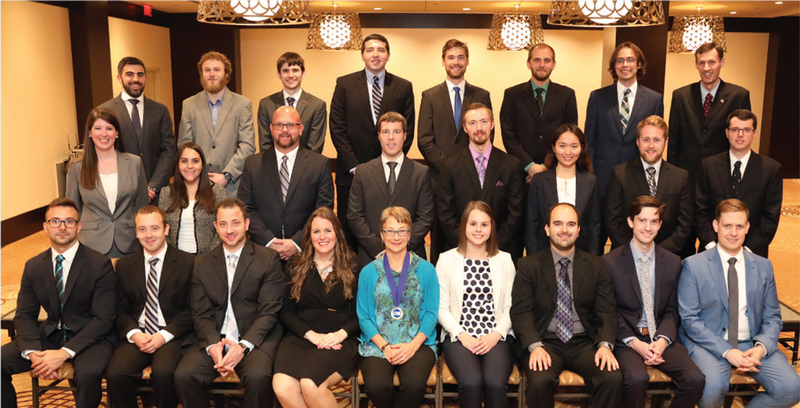 Row 3, left to right: Carl Earnest, Christian Hauprich, Jialing (Jeri) Xu, Mary Beth Lee, Stephanie Dobbs, Robert Henault, Nicholas LeClaire, Stephen Giusti, John Masci, James Bengtson. 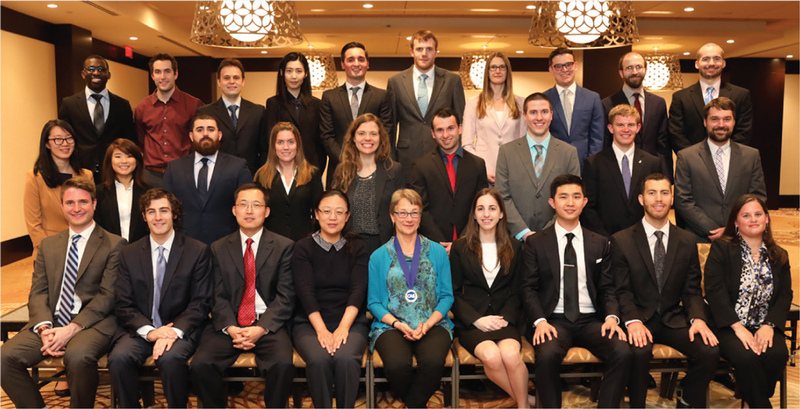 Row 1, left to right: Wing Chi Eugenie Cheng, Meiching Fong, Stanley Wang, Shuo Zhang, CAS President Nancy Braithwaite, Kasey O’Connor, Jamie Gallagher, Joshua LaPointe, Ling-Yu Li. Row 2, left to right: Shayn Weidner, Si Hao Cao, Michael Brahm, Benjamin Cheung, Sinead Cummins, Sonia Barlet, Kathryn Yerry, Danielle Brennan, Jennifer Dyson. Row 3, left to right: Neal Holland, Michael Erd, Jonathan Huang, Julia Osborn, Dean Parnell, Carl Sorel, Kedi Wang, Shiyun Zhang. Row 1, left to right: Wenjing Miao, Kwan Cheung, Michael Gordon, Allen Huang, CAS President Nancy Braithwaite, James Kwok, Amanda Chou, Tasha Jeirath, Joseph Barnett. Row 2, left to right: Gregory Tucker, Wang Xu, Jeffery Chen, Nan Zhou, Katherine Unger, Erica Boulay, Jenny Tam, Joyce Wang, Katherine Buehler. Row 3, left to right: Furquan Burke, Shaolong Wang, Corey Rousseau, Douglas McKean, Kevin Goldsmith, Zachary Kassmeyer, Ellen Raushel, Justin Teal, Michael Donohue. 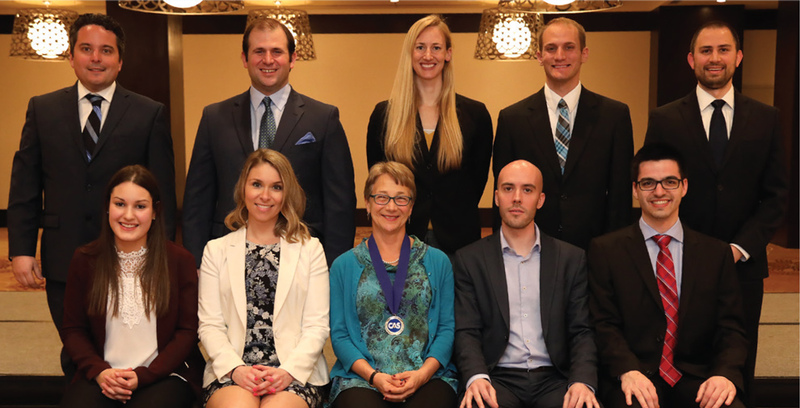 Row 1, left to right: Jonathan Griglack, Daniel Wechsler, Michael Mancuso, Josiane Morin, CAS President Nancy Braithwaite, Melissa Brisson, Matthew Dunlap, Samuel Cleveland, Justin Morrey. Row 2, left to right: Stacey Smith, Erica Palm, Matthew Gatsch, Stephan Bigg, Troy Meadows, Pauline Bao, Phillip Briggs, David Dunlap. Row 3, left to right: Marc Pezzicara, Zachary Altman, Alan Johnson, Robert Prusiewicz, Austin Lynch, Dean Vanden Bush, Erick Vertein, Jay Call. 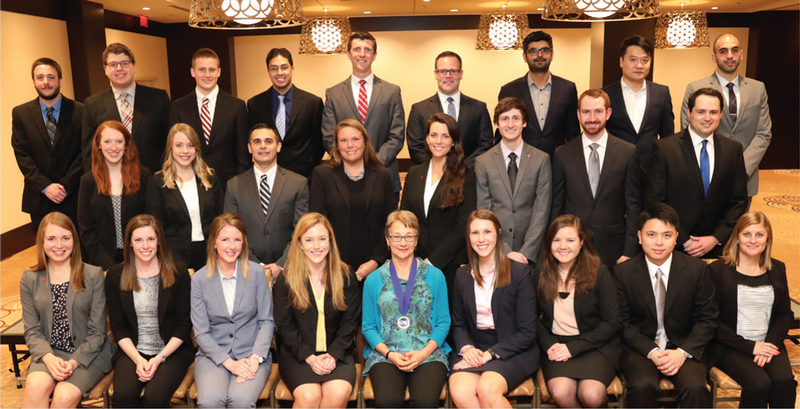 Row 1, left to right: Anna Pan, Yuan Zhao, Megan Hagner, Kathryn Magruder, CAS President Nancy Braithwaite, Ryan Snyder, Promise Tober, Katherine Tubbs, Jacqueline Dufficy. Row 2, left to right: Mu Zhao, Jack Pipa, Winston Tan, Peng Zhao, Xiaoxiao Wang, Mark Woods, Jordan Hammond, Tyler Smith, Adam Weeks. Row 3, left to right: Bethany Giordano, Rabia Momin, Shuai Wang, Zi Chuen Soo, Sebastien Vignola, Michael Murphy, Alexandra Taggart, Codey Mack. Row 1, left to right: Ashley Leonard, Erin Yetter, Ashley Wirz, Mary McAlexander, CAS President Nancy Braithwaite, Sarah Cast, Kelli Chupp, Yuwen Liang, Jodi Gubernat. Row 2, left to right: Samantha Delperdang, Kara Anderson, Neal Kalinsky, Melissa Pinsonneault, Colleen Duggan, Kevin Zech, Bradley Parent, John Laing. 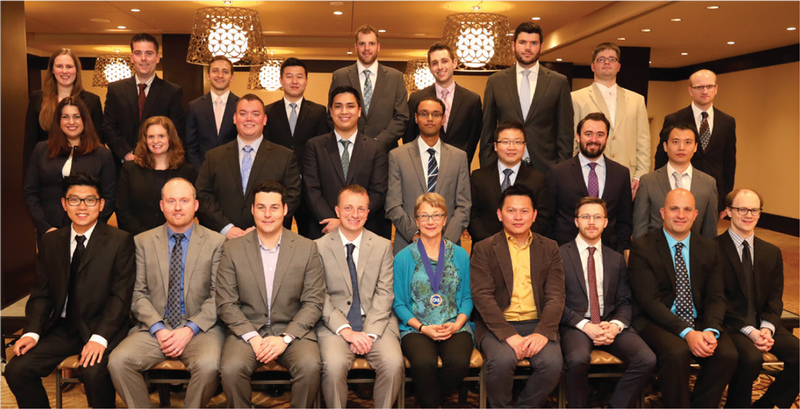 Row 3, left to right: Kyle Koenig, Timothy Barnett, Zachary Keller, Salil Tamhane, Alex Sadowski, Kory Raisbeck, Raza Masood, Chao Huang, Patrick Khalil. Row 1, left to right: Joanie Cloutier, Julie Godbout, CAS President Nancy Braithwaite, Bruno Veillette-Cossette, Mathieu Jacob. Row 2, left to right: Benoit Plante, Will Brown, Amy Carlson, Jordan Pilgrim, Keith Keaveny. Row 1, left to right: Yilin Wei, Matthew Godkin, CAS President Nancy Braithwaite, Yevgeni Plaksienko, François Guérard. Row 2, left to right: Michael Bertoli, Jonathan Prud’Homme Tasse, Joanie Gosselin-Allard, Dave Prud’Homme Tasse, Vincent Lavallée-Laliberté, Etienne Girard-Proulx, Raphael Milot. New Associates not shown: Chelsea Adler, Ankit Anand, Ka Lap Au, Jeong Baek, Kyle Benzing, John Blaser, Stanislav Bogatine, Anthony Bredel, Jonathan Brockman, Joel Bruxvoort, William Bryan, Alex Butensky, Yanjun Chen, Jaehyup Chun, Ho Chung, Benjamin Conrad, Pelepala Coulibaly, Jillian Cudak, Charles Cullen, Linda Deng, Zhifeng Deng, Earon Denovchek, Jeffrey Dozier, Kathryn Fargnoli, Mikalai Filon, Sarah Fiset, Dennis Funkhouser, Sharifa Garcia, Graham Gersdorff, Xue Han, Keith Hebert, Caitlin Hendricks, Yang Hou, Jing Huang, Alice Hung, Hao Jiang, Nancy Kelley, Emily Kessler, Soon Cheol Kim, Ievgen Korol, Kohei Kudo, Bradford Lee, Edward Lee, Jamie Lenney, Changcheng Li, Nathaniel Loughin, Regina Ma, Adam Marszalek, Sydney McIndoo, Matthew Michaels, Zhen Ming, David Morneau, Andrew Newbill, Jesse Nickerson, Sungho Noh, Daniel Nysch, Jeremy Pachtinger, Walker Parent, Brian Paul, Nicole Perilstein, Jamie Phone, Sophie Poulin, Michael Richard, David Schofield, Darin Showalter, Nicole Sims, Elvar Snorrason, Andrew Spisak, Brandon Stevens, Deepti Tammareddi, Jennifer Teter, Angjela Tiko, Kevin Town, Christian Twietmeyer, Matthew Van Hala, Laurence Verheye, Christopher Walendin, Xiaowen Wang, Yaoyan Wang, Amy Watson, Carolyn Wise, Jonathan Woelfel, Victor Wong, Nicholas Wood, Xialing Wu, Tyler Wykoff, Ting Xia, Tianzi Xie, Fei Xu, Xin Xu, Zheng Xu, Zhuoqun Yan, Jonathan Yiu, Lina Yu, Qianyi Zhao, Yue Zhao, Shi Yong Zheng, Wenjie Zhu. 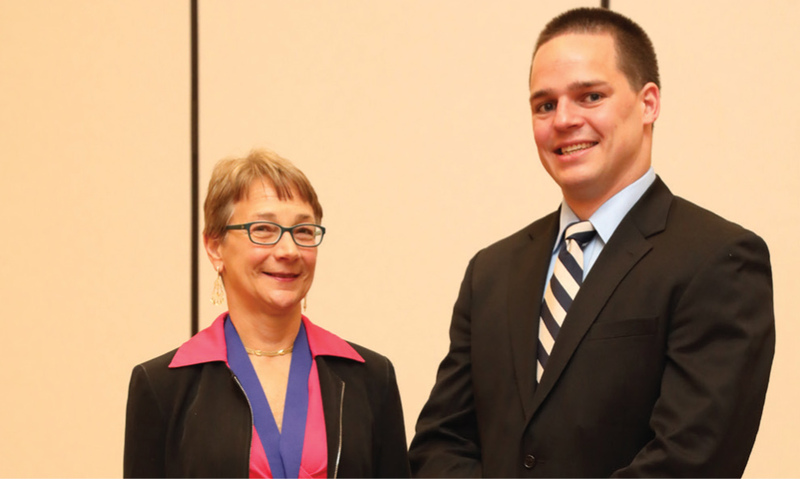 CAS President Nancy Braithwaite (left) with new ACAS Daniel Nysh.